ESIC form 7B is known as medical acceptance card, it is required to get treatment in ESIC dispensary. Insured members can get this form from their employer. Here you can know what is ESIC form 7B & how to fill it and also know the download procedure of ESI form 7B in online. ESIC form 7B also known as medical acceptance card.ESIC form 7B is a request form of insured person to include him or her under a list of a particular doctor in ESIC hospital. ESIC Form 7B consists Two parts in a single page. One part consists of insured person details and other part consists of details of particular under whom the insured person wants to get treatment. On ESIC form 7B write your name, relationship details like father name or husband name, residential address and insurance number. ESIC Medical Acceptance Card needs signatures of both insured person and doctor. Only your employer can download your ESIC form 7B medical acceptance card in their employer ESIC portal. To download ESIC form 7B login to employer portal with their establishment code and password at www.esic.in. After login to this portal, now click on print counter foil under employee. Now enter ESIC IP number of the insured person and click on the print counter file. 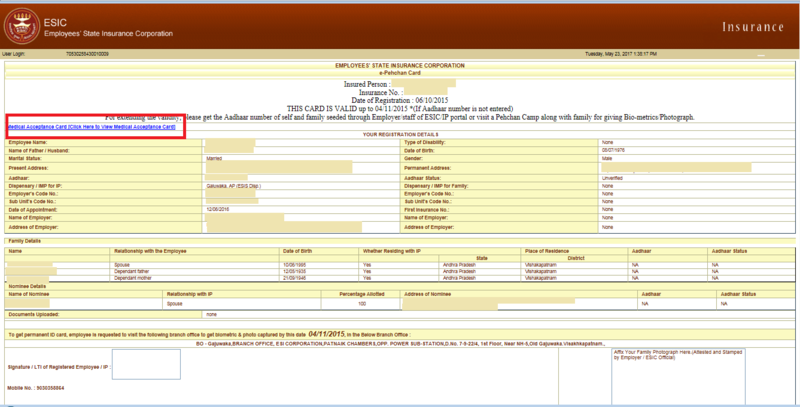 Now employee print counterfoil will appear on the screen, at the top left side of the screen a link to download medical acceptance card pdf file or ESIC form 7B pdf download option of that particular employee will be available. Now click on that link and download ESIC form 7B or ESIC medical acceptance card. Which contains insured person name, insured person’s father name, factory name, residential address of the insured person and IP number of the insured person. In general ESIC pehchan card or temporary ID card (Print counterfoil) will be enough to get treatment in your ESIC dispensary. But in some cases where the patient needs observation of an ESIC doctor for a long time then they need to submit ESIC form 7B. Few of dispensary officialese demands signature on Form 7B, is it compulsory ?? Sir I had updated my Adhar status by own and it also verified .But now I want 2 make e pehchan card .Wats da procedure .After updating Adhar status ? 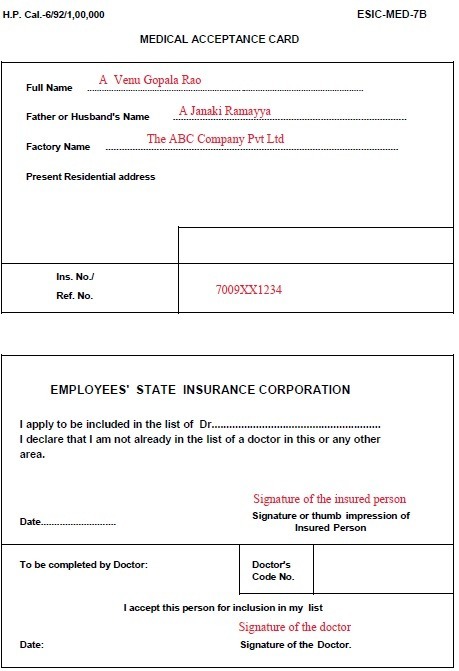 You have to take a temporary ESIC card ( print counter foil) from your employer, but before that make sure that your employer has added all your family members details so that they also get ESI benefits.You can staple A5( Half of A4 Sheet) size photo graph of your family members and take your employer signature ( HR or your Manager) on print counter foil. Once you got the temporary ID card visit your regional ESIC office along with your family members. There ESIC officer will take your family photo graph and within 30 days you or your employer can collect your ESIC card from them. In the mean while you can get medicines and treatment in your respective ESIC dispensary with Temporary ESIC Card i.e print counter foil.